AVAILABILITY: I will be traveling extensively from late February through June 2019, so please email me at smquong@gmail.com to confirm my availability, and to schedule an appointment for a consultation while I am traveling. Thanks. Qi-Mag Feng Shui, Levels 1-3 are now being offered as online, self-study courses. You will receive a workbook in the PDF format, a DVD of Dr. Jes T.Y. Lim teaching the course in English or German, and live webinars will be scheduled for follow-up instruction and coaching. Please call (925) 754-8858 or email smquong@gmail.com to register for the online course. 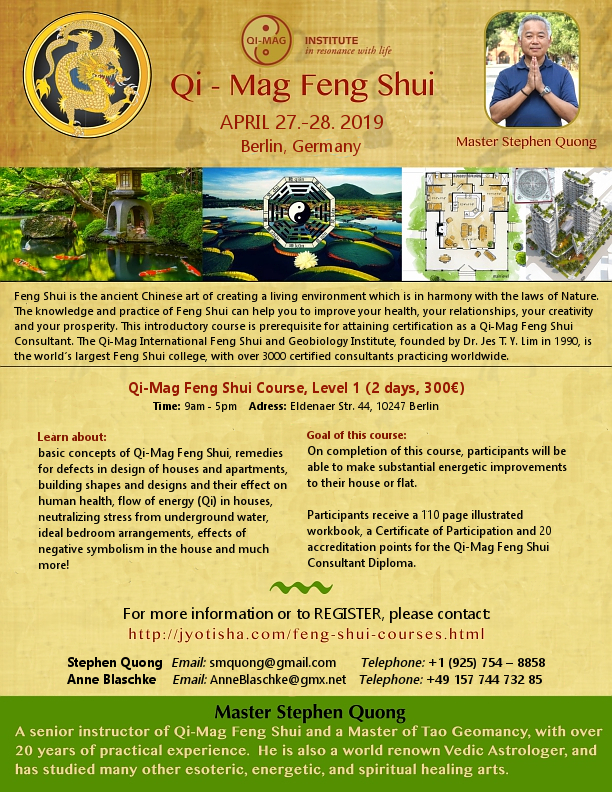 For more information on course content, please visit the web page Qi-Mag Feng Shui Courses. 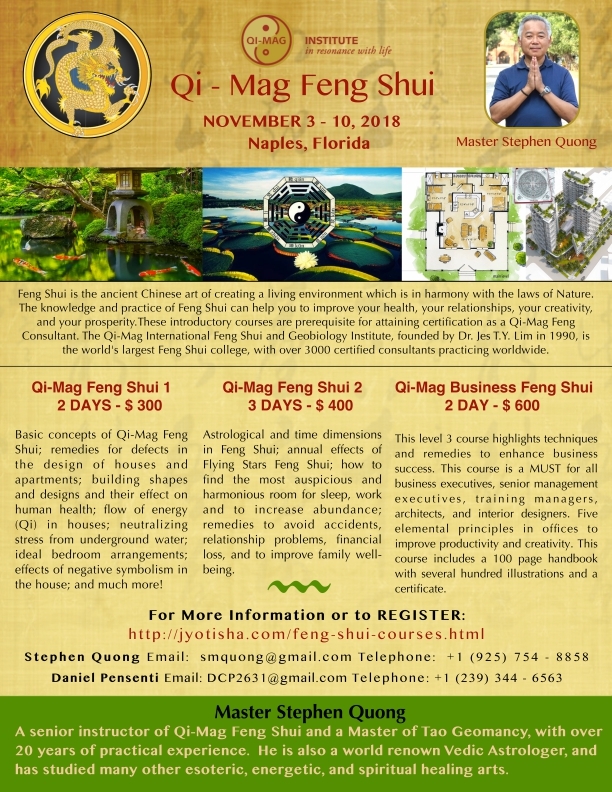 Registration and payment of the tuition fee for the Qi-Mag Feng Shui Correspondence Courses can be done here. Webinar #1: "An Introduction to the Yuen Method of Energy Rebalancing and Instant Healing" This webinar was completed on 6 January 2019. Webinar #2: "Activation of Your Sensitivity to Subtle Energies" Group and individual activations, with the intention of accelerating your development of sensitivity to subtle energies. A higher level of sensitivity is required to practice dowsing, scanning with the hands, muscle testing, radiesthesia, radionics, psychotronics, and direct perception of subtle energy fields. This webinar was completed on Sunday, 20 January 2019. 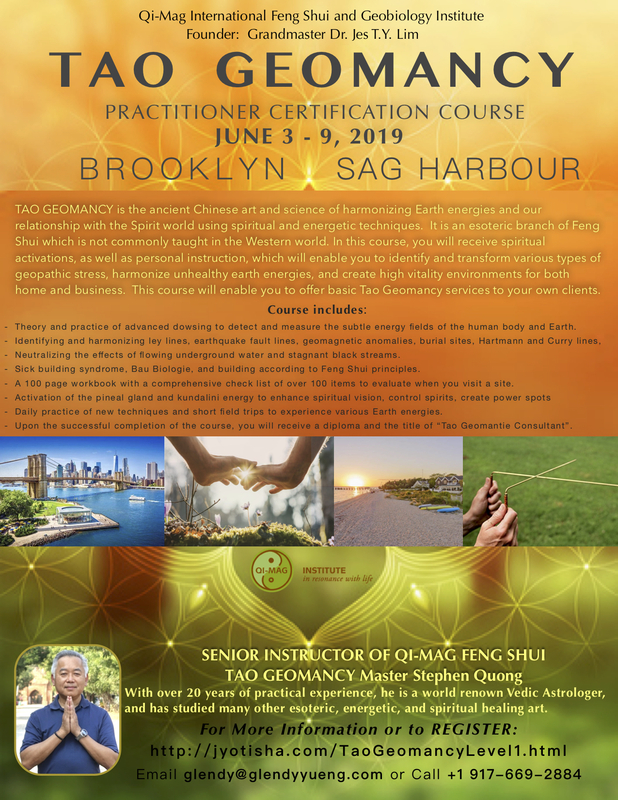 Webinar #3: An Introduction to the Tao Geomancy Certificaton Course, 3-9 June 2019, in Brooklyn and Sag Harbor, New York. Click here to view a free video recording of an introduction to this course, which was recorded on 21 January 2019. Webinar #4: "Remote Sensing: Feeliing and Knowing from a Distance". This webinar will continue with energy clearing and activation of the pineal gland, opening of the heart chakra, discussion of your personal Kundalini and Spiritual Levels, and using the Qi-Mag unit numerical reference scale for diagnosis of health conditions. This webinar was completed on Sunday, 3 February 2019. Webinar #5: "A Journey into the Past...to Clear Karmic Burdens and Energetic Blockages Related to Our Physical Ancestors". Sunday, 17 February 2019, starting at 10:00 a.m. Pacific Standard Time Zone, via GoToMeeting.com. A 90-minute experiential workshop presented by Stephen Quong. You will learn a simple protocol which you can and use to identify and clear your karmic connections with physical ancestors. These karmic connections might be the cause of your own struggles in this life, like energetic blockages, insensitivity to subtle energies, undiagnosable health conditions, lack of spiritual vision and inspiration, and non-fulfillment of your true life purpose. Instructions for joining the webinar will be sent to you after you register. Click here to register. You can pay for the webinar tuition with Bitcoin, Bitcoin Cash, Ethereum, or Litecoin here. Webinar #6: "An Introduction to Dowsing and Radiesthesia.". Sunday, 24 February 2019, starting at 10:00 a.m. Pacific Standard Time Zone, via GoToMeeting.com. A 90-minute online course presented by Stephen Quong. This course is designed for beginners to the art of dowsing and radiesthesia. We will learn how to use pendulums, L-rods, bobbers, aura meters, and other common dowsing instruments. We will also learn a simple muscle testing technique using just our fingers. Some group energy clearing work will be included to clear blockages to learning dowsing, which may exist at the physical, emotional, mental, and spiritual levels. Webinar #7: "Who Do You Love? The Search for the Elusive Soul-Mate (and how to change your karma for having bad relationships).". Sunday, 3 March 2019, starting at 10:00 a.m. Pacific Standard Time Zone, via GoToMeeting.com. A 90-minute online course presented by Stephen Quong. This webinar has been postponed to early April 2019. Registration will be open at the end of March 2019. Please email me at smquong@gmail.com to indicate intrerest in attending this webinar. Practical One-Day Workshop on Tao Geomancy to be offered on Saturday, 23 February 2019 at 146 Main Street, Los Altos, California. Tuition: $180 Members, $200 Non-Members. For more information and to register please contact: Mary Cummings. 18-22 April 2019: A 5-Day Easter Weekend Retreat with Yoga Classes, Satsang, Vedic Astrology readings, and a certificate course on: "Spiritual Healing and the Transformation of Karmas". Held at the picturesque Landhotel Hirshen, Platz 187, 6952 Hittisau, Austria. 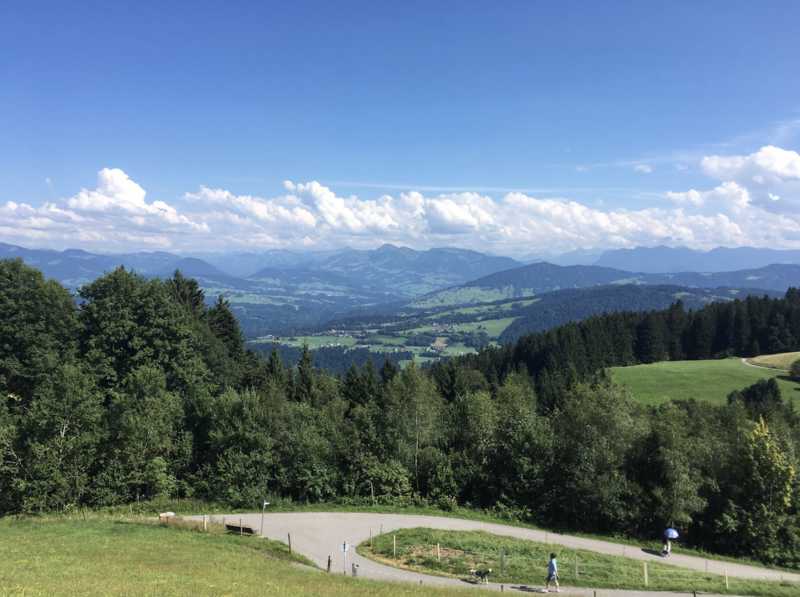 Includes wonderful vegetarian meals and Nature walks in the Austrian Alps. 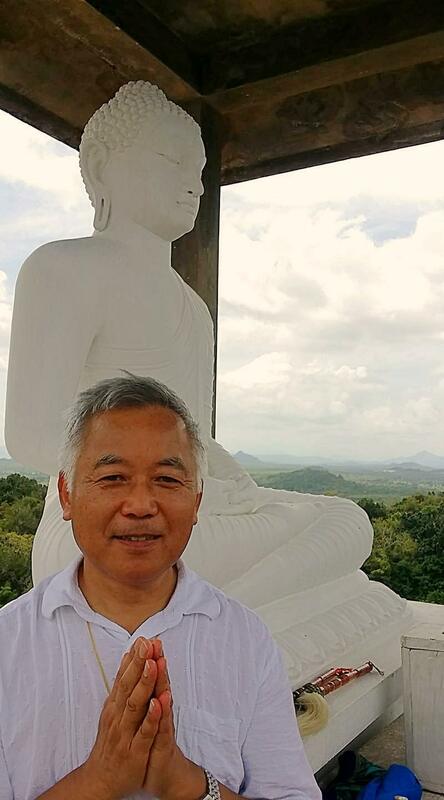 27-28 April 2019: 2-Day Course with Diploma: "Qi-Mag Feng Shui, Level 1". Location: Eldenaer Strasse 44, 10247 Berlin (Friedrichshain), Germany. To register and pay in US Dollars, click here. Also in Berlin: 25-26, 29-30 April 2019: Private Consultations at Ignite Fitness Studio, Husemannstr. 32, Berlin, Germany. Please email smquong@gmail.com to schedule your appointment in advance. 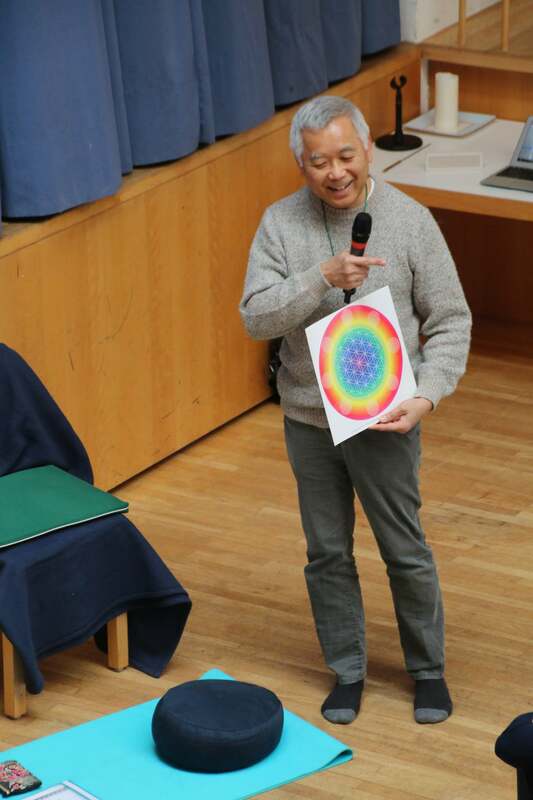 3-5 May 2019: Friday evening presentation by Stephen Quong: "Jyotisha: The Spiritual Astrology of Vedic India". 10 May 2019: Evening Lecture: "Introduction to Jyotisha--The Spiritual Astrology of Vedic India" - at 20:00 hours. Pilgrimage to Shrine of Fatima, Portugal: 15-17 May 2019. The next 7-day certification course is scheduled to begin on Monday, 3 June 2019 in the Bushwick neighborhood of Brooklyn, New York. An optional one-day course on dowsing will be offered on Sunday, 2 June 2019. The first three days of the course will be taught at a private residence in Bushwick. Then we will relocate the course to a private residence in Sag Harbor (Hamptons), Long Island for the second half of the course. Limited on-site accommodations in Bushwick and Sag Harbor are available, so please register early for the best options. Othewise, you will have to arrange for your own accommmodations. The tuition fee does not include the cost of accommodations. You can register for the 3-9 June 2019 course in New York here. You can register for the one-day Dowsing Course in Brooklyn, New York here. You can pay the full tuition in Bitcoin, Bitcoin Cash, Ethereum, or Litecoin here. You can pay a 50% deposit in Bitcoin, Bitcoin Cash, Ethereum, or Litecoin here. 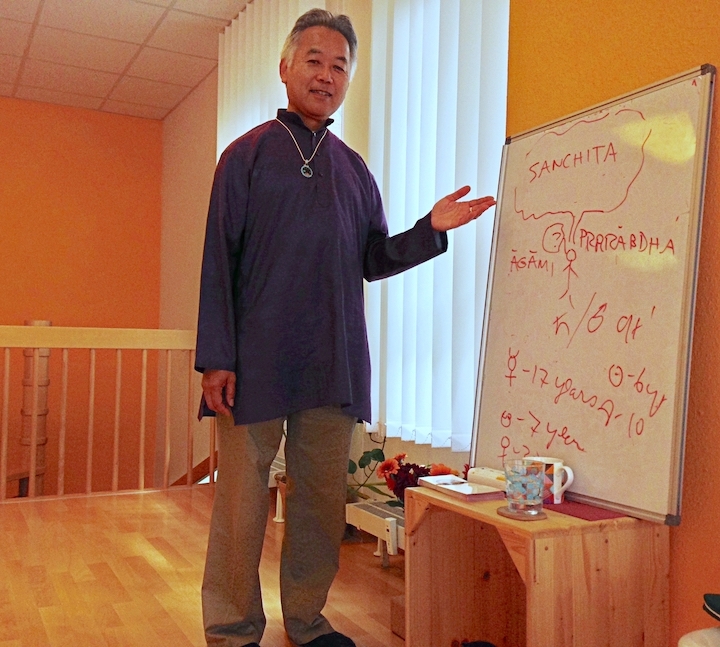 The Tao Geomancy Level 1 course can be offered at your location, anywhere in the world, if you are willing to organize and host a program in your city. A minimum of 12 students is required. Click here to view a free video recording of an introduction to this course, which was recorded on 21 January 2019. 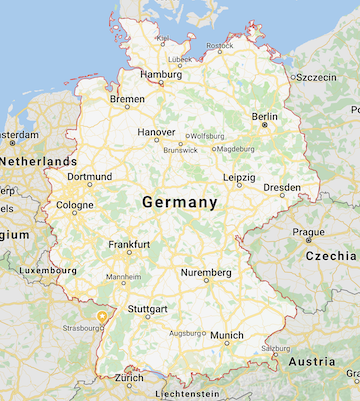 17 April to 12 May 2019: Courses and private consultations in Germany and Austria. The next Tao Geomancy Level 1 7-day certification course is scheduled to begin on Monday, 3 June 2019 in Bushwick, Brooklyn, New York. After three days in Bushwick, we will move to ag Harbor, Long Island for the second half of the course. Free introductory webinar: Click here to view recordiing of webinar from 21 January 2019. 28-30 June 2019: Applied Precognition Project Annual Conference, Las Vegas, Nevada. Meet some of the world's greatest remote viewers! 24-27 October 2019: Guest Speaker at: 2019 Radionics Symposium--Taught by the Masters. 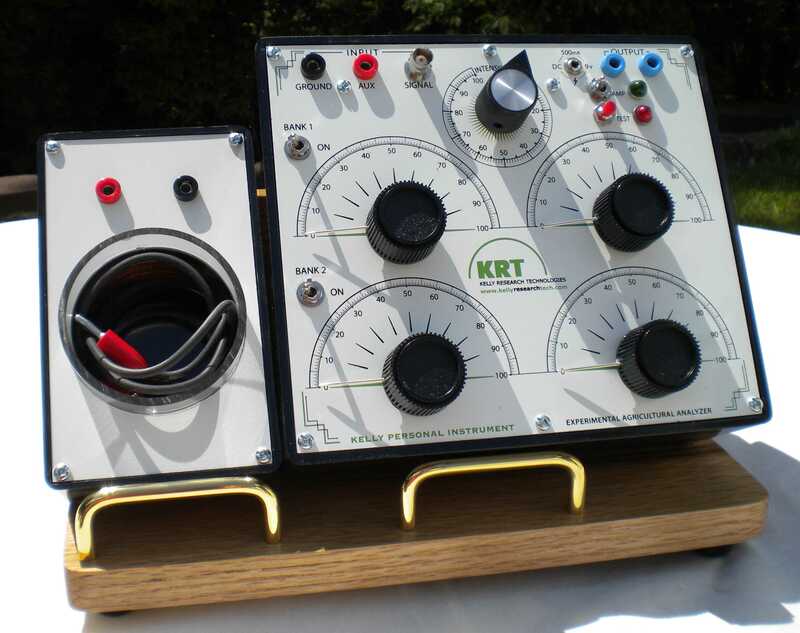 Topic: "Fine-Tuning the Ultimate Radionics Instrument--You!" Please email me if you are interested in hosting a lecture or workshop in your city. I will need at least 12 students to teach outside of the San Francisco Bay Area. Remote Diagnosis, Remote Healing, and Remote Influencing of Future Events, and more. 2009-2019 by Quong Associates. All rights reserved.